Mermaids are all the rage right now! Well, that and DIY bath bombs. 🙂 These crayons are going to be a huge hit! They look super fancy but really it’s a great way to use broken and unwanted crayons. Let the kids help and it might just be the highlight of the summer! Kids would love these just to color with and enjoy any day of the week. They would also be extra special for a mermaid birthday party. 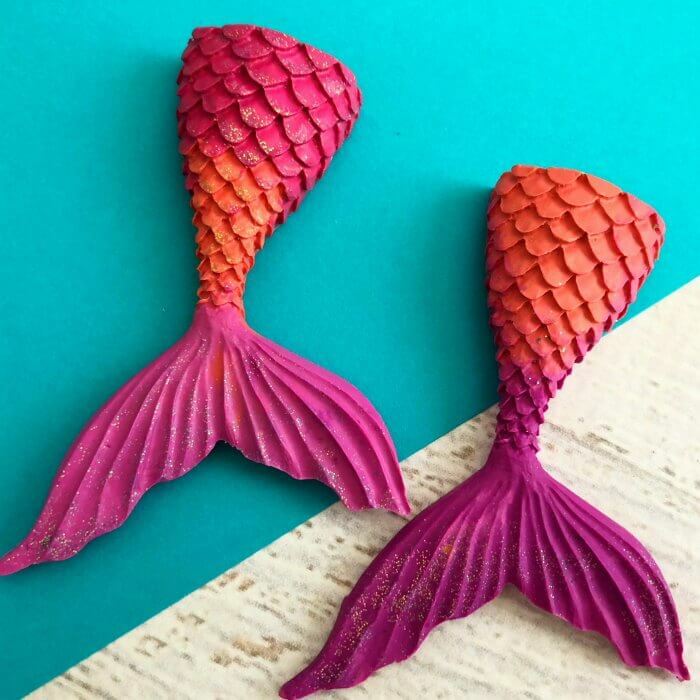 If you have a birthday coming up that is mermaid themed, these adorable crayons would be the perfect party favor! Put them in a cellophane party bag and you are set! I love these mermaid stickers you can order. How adorable would these be attached to each bag of crayons? Love it! They are actually stickers so you don’t have to fool with ties or ribbons. Just place the cute little mermaid tags right on the bag! So easy! You could put a coloring book with the crayons if you wanted to. It’s not necessary though. 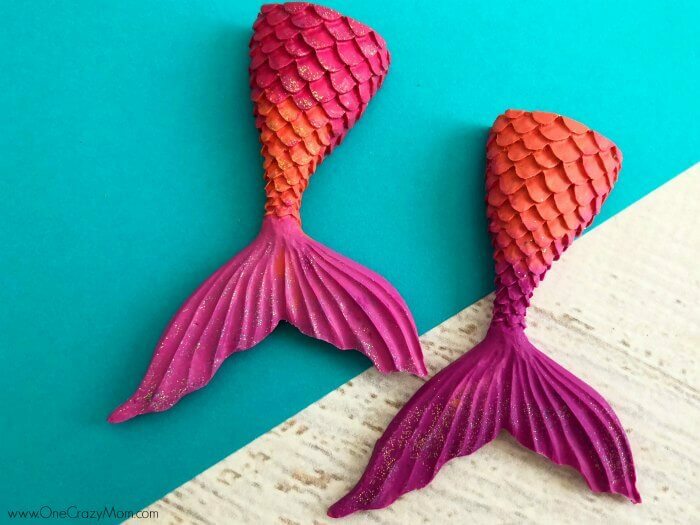 These mermaid crayons are so cute they are great by themselves! Whatever you decide, these crayons are going to be so fun to hand out at the party! Such an adorable idea for a little little mermaid birthday party! I can hardly wait to use these for birthday parties! They are going to be the hit of the party! Even better, I can just round up all the broken crayons to make this really frugal! Ideas that don’t break the bank are awesome! 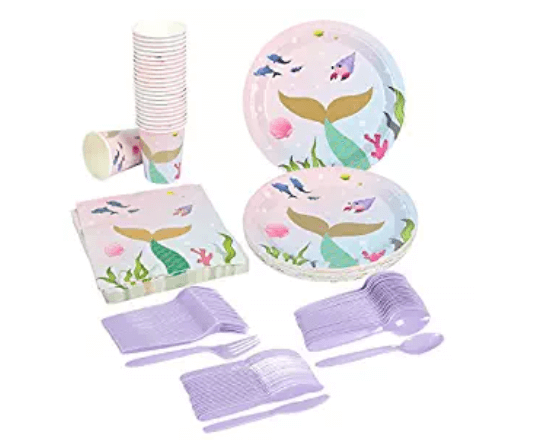 Mermaid Plates, Napkins and more! 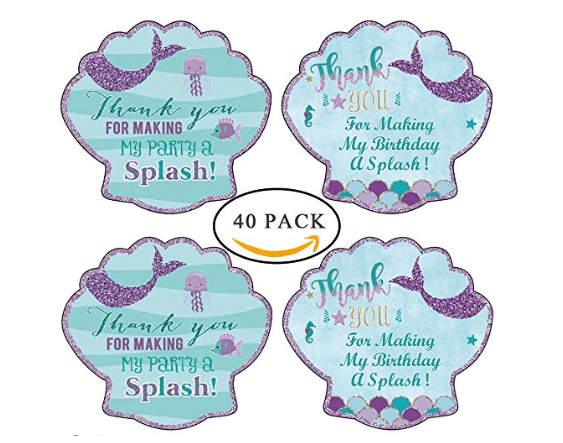 So many fun mermaid party supplies! You can also find frugal birthday party decoration ideas to go with any theme. There are lots of great ideas to help you stay on track with your budget. The party doesn’t have to cost a fortune to be amazing! Focus on one themed item to save money and use solid color items for the other items. This saves a ton of money! Plus, the party will still be super cute! Let’s learn how to make crayons! 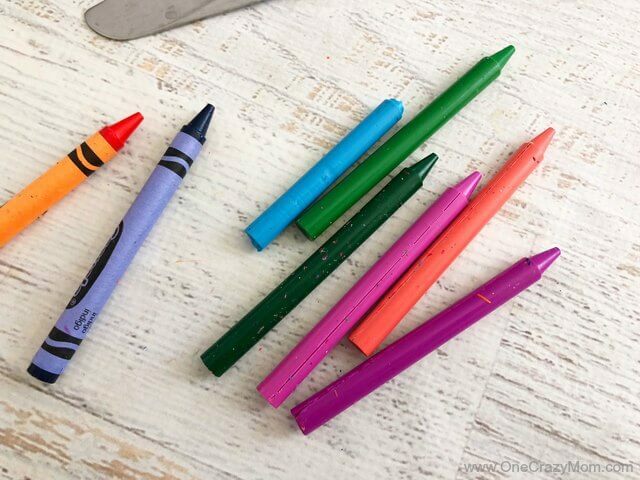 It’s very simple and I love that I can use broken crayons I have around the house. 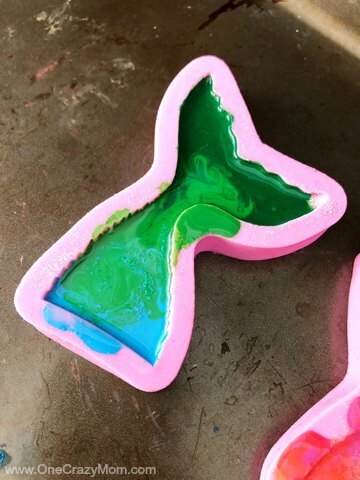 You will need to get an oven safe mermaid silicone mold to make the mermaid crayons. They are on sale right now so it’s a good time to grab a mold! 1. Peel the crayon wrapper off and preheat your oven to 250 degrees. 2. Sprinkle a little glitter into your molds. 3. 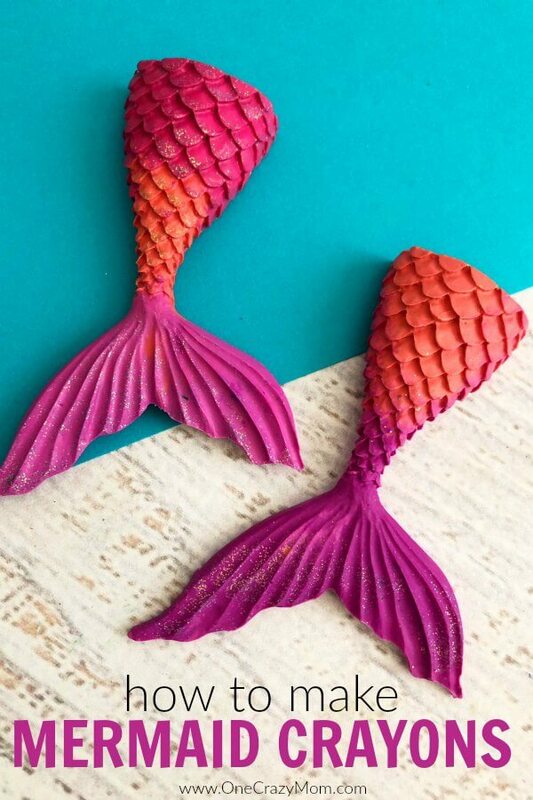 Break the crayons in several pieces and place into the mermaid tails a few of the same colored crayons at a time so it will have an ombré look. 4. 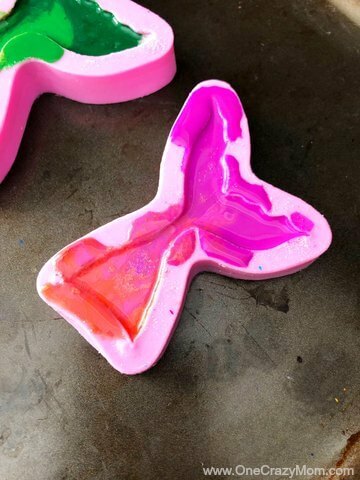 Place your silicone molds onto a baking sheet and place in a preheated 250° oven for 8 to 10 minutes, checking halfway through to see if they’ve fully melted. 5. Carefully remove the pan with an oven mitt, place on the stove until cool and then transfer to the freezer for about 15 minutes. 6. 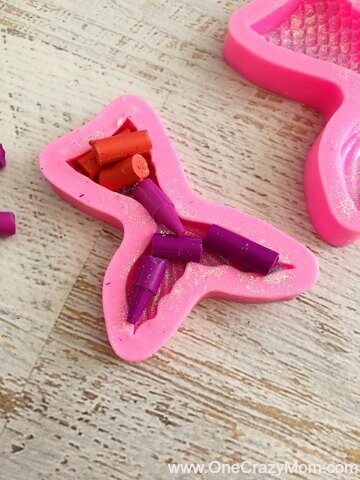 Carefully stretch out the sides of the mold and pop your crayons out. 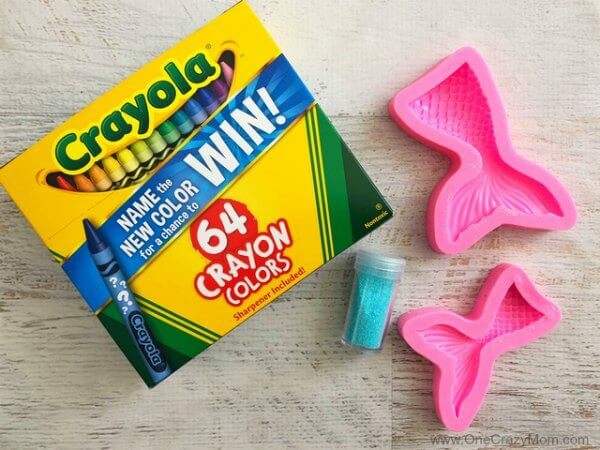 Mermaid Tails Crayons are so simple to make! The results are stunning! The glitter really adds to the ombre effect. I just love these adorable crayons. If you are concerned about using your good cookie sheets and the crayons spilling, you can get an inexpensive pan at the dollar store. I actually have several dollar store cookie sheets that I keep with my craft supplies. They are so handy! I don’t worry about the kids getting craft supplies on them and love knowing it was just a $1! 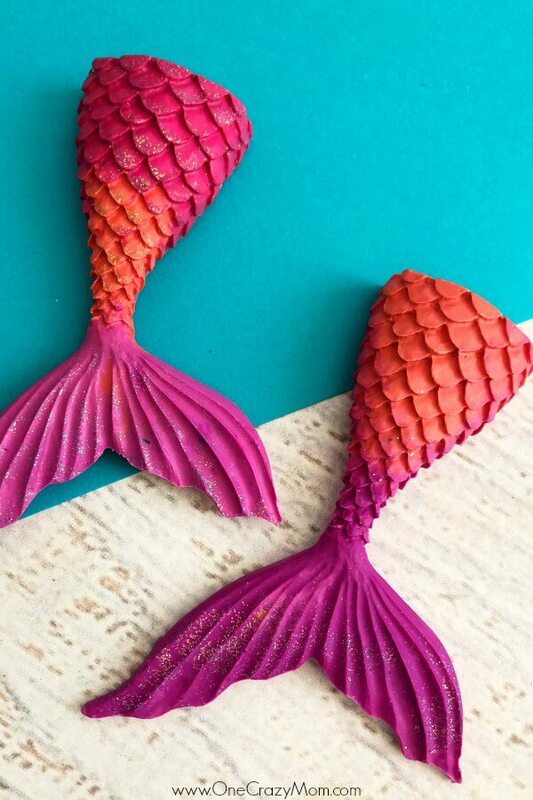 Your kids will go crazy over Mermaid crafts! The kids can help design the crayons. Let them choose the colors they love the best. So fun! Everyone will enjoy seeing how different each mermaid crayon turns out. It’s a great way to let individual creativity shine. 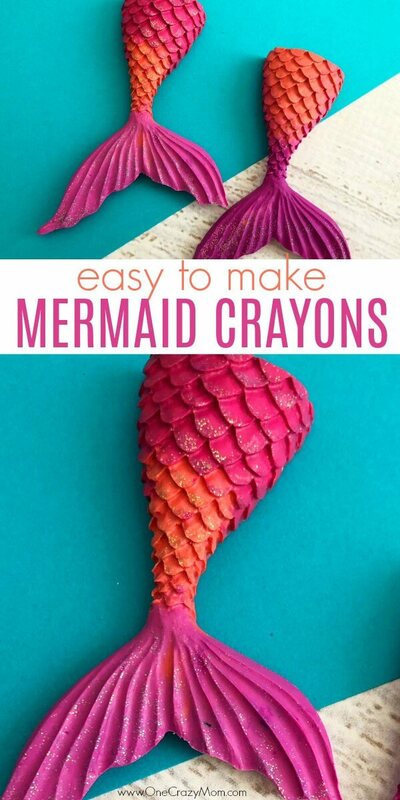 Now that you know how to make crayons shaped like mermaid tails, let the fun begin! Everyone will love these adorable crayons. Whether you are making these for a party or just to surprise the kids, they are sure to be a hit! Mermaid crayons are absolutely gorgeous. What colors will you use to make your crayons? Keep the kids busy all summer with more fun crafts. We have the best time crafting and finding DIY ideas we can tackle. These are the best memories! Plus, it’s nice to not be running here and there. Sometimes, a simple day at home crafting is just what is needed. It’s been terribly hot lately, try these 25 Boredom Busters for Kids (to do indoors) to beat the heat! You just never know what craft we might be doing! 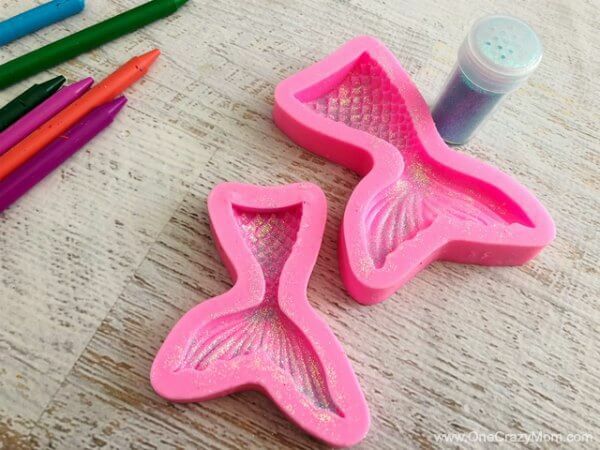 Enjoy and let us know how the Mermaid Tails Crayons turn out for you!